Hanover or Hannover, on the river Leine, is the capital of the federal state of Lower Saxony (Niedersachsen), Germany and was once by personal union the family seat of the Hanoverian Kings of Great Britain, in their dignities as the dukes of Brunswick-Lüneburg (which title was later called the Elector of Hanover at the end of the historical period known as Early Modern Europe). After the Napoleonic Wars ended, the Electorate was enlarged and made into the capital of the Kingdom of Hanover. 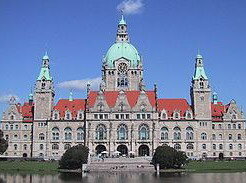 In addition to being the capital of Lower Saxony, Hanover was the capital of the administrative area Regierungsbezirk Hannover (Hanover region) until Lower Saxony's administrative regions were disbanded at the beginning of 2005. 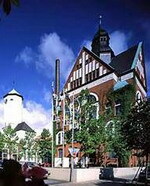 It is, however, still part of the Hanover district (Region Hannover), which is a municipal body made up from the former district and city of Hanover. The city is a major center of northern Germany, known for hosting annual commercial expositions such as the Hanover Fair and the CeBIT. Every year Hanover hosts the Schützenfest Hannover, the world's largest Marksmen's Fun Fair, and the Oktoberfest Hannover, which is the second largest Oktoberfest in the world. In 2000, Hanover hosted the world fair Expo 2000. The Hanover fairground, due to numerous extensions especially for the Expo 2000, is the largest in the world. Hanover also has regional importance because of its universities and medical school, its international airport, and its large zoo. The city is also a major crossing point of railway lines and highways (Autobahnen), connecting European main lines in east-west-direction (Berlin - Ruhr area) and north-south-direction (Hamburg - Munich et al.). Situated in the Lower Saxony capital of Hannover, Germany, the Crowne Plaza Hotel Hannover is 300 metres from Hannover train station, 2.5 kilometres from Maschsee Lake, and four kilometres from the Baroque Gardens. Housed in a red brick, pinnacle-shaped building, the Crowne Plaza Hannover features a wellness centre that offers massages, Thalasso treatment, Sanshui Asian spa day, and facial treatments. Complimentary use of the fitness centre is available, and guests can use the sauna and steam bath for a surcharge. There are two parking decks at the hotel for self-parking and valet-parking, both available for a surcharge. In Bistro im Schweizerhof guests can enjoy Mediterranean cuisine and a selection of wines, and during the summer a terrace opens for outside dining. Snacks and drinks are served in the hotel bar, and a large screen television broadcasts sports events. The Mercure Hotel Hannover Mitte is a modern, six-floor property centrally located in the city of Hannover, two kilometres from Lake Maschsee and six kilometres from Hannover Zoo. 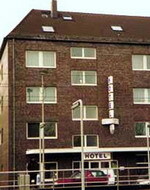 This business and leisure hotel's facilities include a bar, a restaurant serving Italian, French and German fusion cuisine and featuring stylish and contemporary decor, wireless Internet connections throughout the hotel for those with laptops, a dry cleaning service, currency exchange, garage parking, and conference facilities which can accommodate up to 176 people. The hotel is in an excellent position to explore the city; shopping is available 200 metres away, as is the street art project, Sculpture Mile. The Royal Gardens of Herrenhausen are four kilometres away, and Lake Maschsee, a large artificial lake used for swimming, water sports and as the venue for the annual Maschsee Festival, is one kilometre from the hotel. 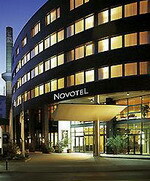 Novotel Hannover is located in Hannover, Germany, one kilometre from both the city centre and the Zoo. Sprengel Art Museum is three kilometres away. This modern hotel features 15 meeting rooms, and wireless Internet is accessible in the public areas of the hotel, all of which are air- conditioned. There is also an indoor playground for children on site. Novotel Hannover's Intermezzo restaurant serves a number of international dishes for lunch and dinner, and the Tete a Tete bar offers drinks. The hotel's 206 guestrooms all include satellite television, wireless Internet access, climate control, minibars, tea and coffee facilities, and hair dryers. Set amongst trees, the Sheraton Pelikan Hannover is situated in Hannover, three kilometres from the city centre and 500 metres from the forest. The 147 guestrooms have feature strong colours and contemporary furniture. Guests can enjoy a work out in the fitness suite, and then relax in the sauna or steam room. At the 5th Avenue Restaurant, diners can enjoy regional dishes and international specialities in a modern setting, and in fine weather, meals can be taken on the terrace. Before or after dinner, guests can chat over drinks or cocktails in Harry's New-York Bar, where live piano music is on offer. Room service is available round the clock, and multilingual staff at the 24-hour front desk can help with a range of services from dry cleaning to currency exchange; parents will appreciate the babysitting service. Garage parking is available for drivers and those interested in sightseeing can use the Internet to plan an itinerary. Herrenhauser Royal Gardens are five kilometres away, and Hannover Airport is approximately 15 kilometres and a 20-minute drive from the hotel. The Ramada Hotel Britannia Hannover is located in Hannover, Germany, 800 metres from the Hannover trade centre, 1.5 kilometres from the TUI concert hall and 10 kilometres from the centre of Hannover. 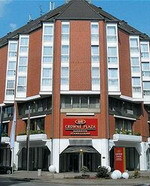 The hotel is within 800 metres of Eichstrabe metro station. 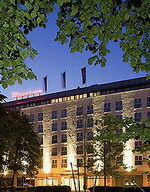 The Ramada Hotel Britannia Hannover is a modern hotel surrounded by gardens. The hotel's sports centre includes a sauna, steam bath and solarium, badminton and tennis courts. Multilingual staff can arrange currency exchange, express check-in and check-out and limited-hours room service. Other hotel amenities include complimentary parking, laundry services and wireless Internet access. 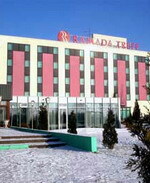 The Ramada restaurants have classic decor with pale-green painted walls and art-nouveau style decorative lighting. They both serve international and seasonal specialities. Mini-golf, tennis, badminton and boules can be played at the hotel. There is a park 200 yards from the hotel for jogging and walking. The Vahrenwalder Hannover Hotel is a bright and modern property with lots of natural daylight, set two kilometres from Hannover City Centre on the main tram line. This four-floor hotel features 92 simply furnished, modern guestrooms set across four buildings. All include complimentary wireless Internet access, desks and private bathrooms. After a buffet breakfast, guests can unwind in the Finnish sauna. Wireless Internet access is free of charge and available throughout the hotel for guests to plan sightseeing itineraries of keep in touch with friends and family. The modern bar is open round the clock and serves drinks and light snacks. Business guests can enjoy access to three meeting rooms able to accommodate up to 35 people. Audio-visual equipment and additional break out rooms are available. Guests arriving by car will find free car parking on site. Hannover Airport is 8 kilometres away with an approximate driving time of 25 minutes.